Archaeology & Forensics | GSSI Geophysical Survey Systems, Inc. Archaeologists and remote sensing specialists around the world rely on GSSI ground penetrating radar (GPR) as a key tool for non-invasive site investigation. Whether the goal is site mapping for excavation or locating sensitive cultural resources for preservation or avoidance, GSSI's remote sensing technologies have been the tools of choice for nearly 50 years. 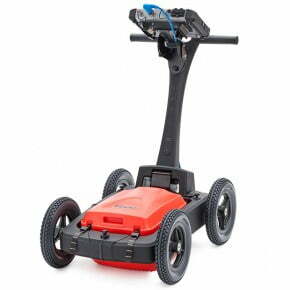 GPR is used by law enforcement and crime scene investigators to locate clandestine burials and buried objects. GPR has been instrumental in locating victims, hidden caches of weapons or evidence, and helping to locate the remains of soldiers and civilians killed in war zones. 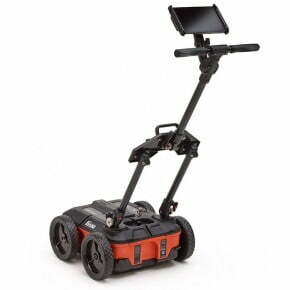 Ground penetrating radar is used to locate areas for excavation and are best suited for shallow, non-destructive investigations. This data image shows a complex multi grid GPR survey and overlay of appliance supported by a CAD drawing. This data shows excavation planning around historical buildings. Note the large number of grids. RADAN 7 was used to spatially orient this image. Archaeologists, scientists and law enforcement professionals use ground penetrating radar as a rapid survey method that can facilitate in locating burial sites and delineate cemetery boundaries. 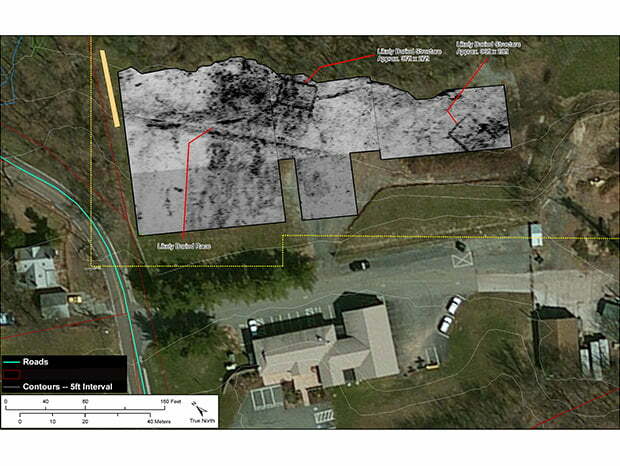 This data image is a result of a GPR survey for unmarked graves and glaciomarine clay. The SIR 4000 and 350 MHz antenna were used for the survey. 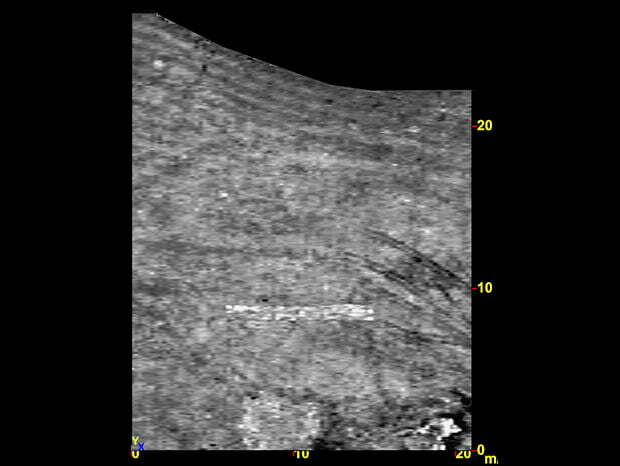 Note: Distinct grave outlines in a sediment type to be considered less than ideal for GPR. This data has been overlaid with drone derived data sets. Archaeologists use GSSI ground penetrating radar during phase II site investigation in order to maximize phase III data recovery. Identification of buried historical structures in conjunction with CRM projects. This image shows 18th Century mill foundations and a mill race that supplied water power for machinery. The SIR 3000 and 400 MHz were used in this survey. Ground penetrating radar can assist law enforcement and crime scene investigators in locating evidence behind brick or concrete walls, wooden floors or in hidden compartments. GPR can also aid in ruling out suspect areas in minutes. This data example was in a simulated wall with 2×4 construction with a 9mm handgun sitting on a horizontal 2×4. 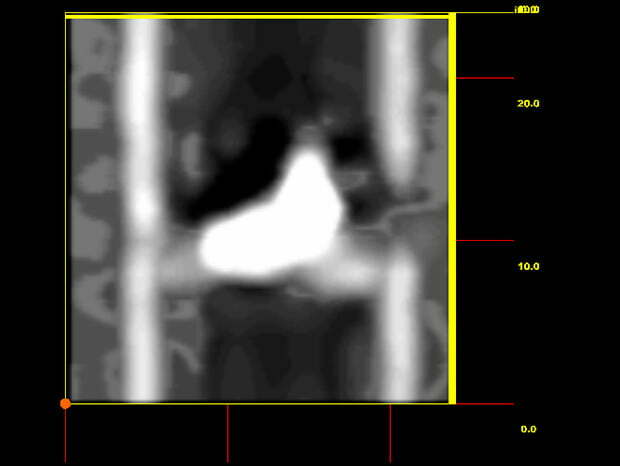 Data was collected with a SIR 4000 and a 2 GHz Palm Antenna, and post-processed using the 3D Module in RADAN 7. Ground penetrating radar is an invaluable aid to law enforcement in locating disturbed sites and shallow graves that are nearly undetectable when viewed from the surface. Identification of excavated and filled trenches in a field. 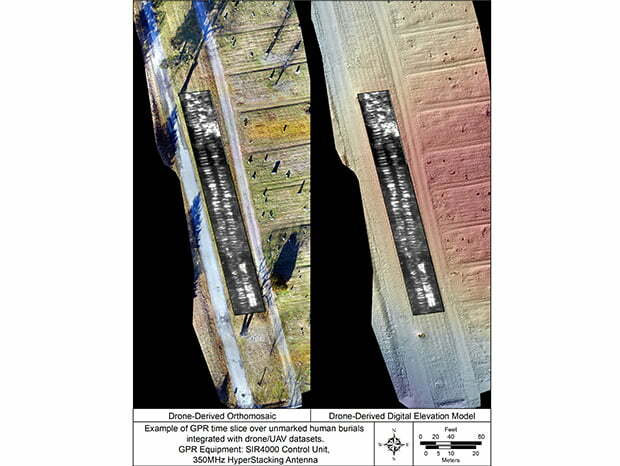 This GPR time slice data shows a rectangular backhoe trench and tire tracks. This data was collected with the SIR 4000 and a 300/800 dual-frequency digital antenna.